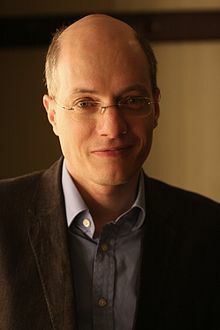 Alain de Botton, FRSL (/dəˈbɒtən/; born 20 December 1969) is a Swiss-born British philosopher and author. His books discuss various contemporary subjects and themes, emphasizing philosophy's relevance to everyday life. He published Essays in Love (1993), which went on to sell two million copies. Other bestsellers include How Proust Can Change Your Life (1997), Status Anxiety (2004) and The Architecture of Happiness (2006). De Botton was born in Zürich, the son of Jacqueline (née Burgauer) and Gilbert de Botton, who was born in Alexandria, Egypt, and expelled under Nasser. Gilbert went to live and work in Switzerland, where he co-founded an investment firm, Global Asset Management; his family was estimated to have been worth £234 million in 1999. Alain de Botton's Swiss-born mother was Ashkenazi, and his father was from a Sephardic Jewish family from the town of Boton[clarification needed] in Castile and León. De Botton's ancestors include Abraham de Boton. De Botton's paternal grandmother was Yolande Harmer. He has one sister, Miel, and they received a secular upbringing. Alain spent the first twelve years of his life in Switzerland where he was brought up speaking French and German. De Botton attended the Dragon School where English became his primary language. He was later sent to board and study at Harrow School, a public school in England. He has often described his childhood as that of a shy child living in boarding schools. De Botton read History at University of Cambridge, where he was a member of Gonville and Caius College. He then completed an MPhil in Philosophy at King's College, London (1991–1992). He began studying for a PhD in French philosophy at Harvard University, but gave up this research to write books for the general public. In his first novel, Essays in Love (titled On Love in the U.S.), published in 1993, de Botton deals with the process of falling in and out of love. In 2010, Essays in Love was adapted to film by director Julian Kemp for the romantic comedy My Last Five Girlfriends. De Botton wrote a sequel to Essays in Love, published in 2016, titled The Course of Love. In 1997 he published his first non-fiction book, How Proust Can Change Your Life, based on the life and works of Marcel Proust. It was a bestseller in both the US and UK. This was followed by The Consolations of Philosophy in 2000. The title of the book is a reference to Boethius's Consolation of Philosophy, in which philosophy appears as an allegorical figure to Boethius to console him in the period leading up to his impending execution. In The Consolations of Philosophy, de Botton attempts to demonstrate how the teachings of philosophers such as Epicurus, Montaigne, Nietzsche, Schopenhauer, Seneca, and Socrates can be applied to modern everyday woes. The book has been both praised and criticized for its therapeutic approach to philosophy. In 2004, he published Status Anxiety. In The Architecture of Happiness (2006), he discusses the nature of beauty in architecture and how it is related to the well-being and general contentment of the individual and society. He describes how architecture affects people every day, though people rarely pay particular attention to it. A good portion of the book discusses how human personality traits are reflected in architecture. He defends Modernist architecture, and chastises the pseudo-vernacular architecture of housing, especially in the UK. "The best modern architecture," he argues, "doesn't hold a mirror up to nature, though it may borrow a pleasing shape or expressive line from nature's copybook. It gives voice to aspirations and suggests possibilities. The question isn't whether you'd actually like to live in a Le Corbusier home, but whether you'd like to be the kind of person who'd like to live in one." In The Pleasures and Sorrows of Work (2009), de Botton produced a survey of ten different jobs, including accountancy, rocket science and biscuit manufacture. The book, a piece of narrative non-fiction, includes two hundred original images and aims to unlock the beauty, interest and occasional horror of the modern world of work. After a negative review of the book by New York Times critic Caleb Crain, de Botton posted a scathing ad hominem attack against Crain. He later apologized for his remarks. In August 2009, de Botton applied to a competition advertised among British literary agents by BAA, the airport management company, for the post of "writer-in-residence" at Heathrow Airport. The post involved being seated at a desk in Terminal 5, and writing about the comings and goings of passengers over a week. De Botton was duly appointed to the position. The result was the book, A Week at the Airport, published by Profile Books in September 2009. The book features photographs by the documentary photographer Richard Baker, with whom de Botton also worked on The Pleasures and Sorrows of Work. In October 2013, he published Art as Therapy, co-written with the Australian-Scottish art historian, John Armstrong. Art as Therapy argues that certain great works of art "offer clues on managing the tensions and confusions of everyday life". In February 2014, de Botton published his fourteenth book, a title called "The News: A User's Manual", a study of the effects of the news on modern mentality, viewed through the prism of 25 news stories, culled from a variety of sources, which de Botton analyses in detail. The book delved with more rigour into de Botton's analyses of the modern media which appeared in Status Anxiety. De Botton used to write articles for several English newspapers, and from 1998 to 2000, wrote a regular column for The Independent on Sunday. He travels extensively to lecture and has his own production company, Seneca Productions, which makes television documentaries based upon his works. He has given lectures at TED conferences. In July 2011, he spoke in Edinburgh about "Atheism 2.0", an idea of atheism that also incorporates our human need for connection, ritual and transcendence. In July 2009, he spoke at Oxford University about the philosophy of failure and success, and questions the assumptions underlying these two judgments. De Botton has written in a variety of formats to mixed response. Positive reviews of his books attest that he has made literature, philosophy and art more accessible to a wider audience. Negative reviews allege that de Botton tends to state the obvious and have characterized some of his books as pompous and lacking focus. So I think where people tend to end up results from a combination of encouragement, accident, and lucky break, etc. etc. Like many others, my career happened like it did because certain doors opened and certain doors closed. You know, at a certain point I thought it would be great to make film documentaries. Well, in fact, I found that to be incredibly hard and very expensive to do and I didn’t really have the courage to keep battling away at that. In another age, I might have been an academic in a university, if the university system had been different. So it's all about trying to find the best fit between your talents and what the world can offer at that point in time. The idea is to challenge traditional universities and reorganise knowledge, directing it towards life, and away from knowledge for its own sake. In a modest way, it’s an institution that is trying to give people what universities should I think always give them: a sense of direction and wisdom for their lives with the help of culture. In May 2009, de Botton launched a project called "Living Architecture" – which builds holiday rental houses in the UK using leading contemporary architects. These include Peter Zumthor, MVRDV, JVA, NORD and Michael and Patti Hopkins. The most recent house to be announced is a collaboration between the Turner-prize winning artist Grayson Perry, and the architecture firm FAT. The houses are rented out to the general public. De Botton, the creative director and chairman of Living Architecture, aims to improve the appreciation of good contemporary architecture – a task which is the practical continuation of his theoretical work on architecture in his book The Architecture of Happiness. In October 2009, he was appointed an honorary fellow of the Royal Institute of British Architects (RIBA), in recognition of his services to architecture. In 2014, de Botton was invited by three museums – the Rijksmuseum in Amsterdam, the National Gallery of Victoria in Melbourne and the Art Gallery of Ontario in Toronto – to contribute content to special exhibitions based on his work, Art as Therapy. De Botton and his colleague John Armstrong inserted captions, arranged on large Post-it-style labels designed by the Dutch Graphic artist, Irma Boom, bearing slogans and commentary on exhibits throughout the Rijksmuseum. De Botton has described his relationship with his father as difficult, stating: "When I sold my first bestseller (and a million dollars was peanuts for my father) he was not impressed and wondered what I was going to do with myself." When his father died, his family was left a large trust fund, although de Botton says his income is derived solely from his own activities (book sales, speaking engagements, business consulting, The School of Life). Alain's stepmother Janet de Botton is a prominent patron of the arts and competition bridge player. De Botton lives in London with his wife, Charlotte, and their two offspring. In August 2014, de Botton was one of 200 public figures who were signatories to a letter to The Guardian opposing Scottish independence in the run-up to September's referendum on that issue. De Botton, Alain (1993). Essays in love. London: Macmillan. — (1993). On love. New York: Grove Press. Variant title in USA. — (1994) . Essays in love. Paperback reprint. London: Picador. — (2006). Essays in love. Revised ed. London: Picador. — (2015) . Essays in love. Reprint of 2006 revised ed. London: Picador. De Botton, Alain; Armstrong, John (2013). Art as therapy. London: Phaidon Press. Hamilton, Ben (4 January 2014). "The healing art". Books. The Spectator. 324 (9671): 23–24. Review of Art as therapy. In 2011 he presented a series of talks for the BBC Radio 4 series A Point of View. ^ "Gilbert de Botton", The Telegraph, obituaries, 30 August 2000. ^ Ian Black and Benny Morris (2007). Israel's Secret Wars: A History of Israel's Intelligence Services. Grove Press. p. 70. ISBN 978-0-8021-3286-4. ^ de Botton, Alain (24 December 2011). "An atheist at Christmas: Oh come all ye faithless". The Guardian. London. ^ "King's College London - Notable alumni". Kcl.ac.uk. Retrieved 26 August 2014. ^ "Tribeca Film - MY LAST FIVE GIRLFRIENDS". tribecafilm.com. New York. Retrieved 1 June 2016. ^ "Interview with Alain de Botton" Archived 5 January 2016 at the Wayback Machine, writerspace.com; accessed 26 February 2014. ^ "Official Bio". Alain de Botton. ^ Adams, Stephen (1 July 2009). "Alain de Botton tells New York Times reviewer: 'I will hate you until I die'". Telegraph. London. Retrieved 1 July 2015. ^ Neyfakh, Leon (1 July 2009). "Is Alain de Botton Sorry About Angry Comment Left On Critic's Blog?". Observer. London. Retrieved 1 July 2015. ^ "Art as Therapy", cooper.edu; accessed 26 February 2014. ^ Ted.com, TED Talks|Alain de Botton: A kinder, gentler philosophy of success; accessed 26 February 2014. ^ "The Consolations of Philosophy". www.complete-review.com. Archived from the original on 16 April 2010. Retrieved 23 March 2010. De Botton's idea of bringing philosophy to the masses and presenting it in an unthreatening manner (and showing how it might be useful in anyone's life), is admirable; the way he has gone about it is less so. ^ "Philosophy for a night out at the Dog and Duck". London, UK: The Independent. 3 April 2000. Retrieved 11 July 2009. ^ Hamilton, Fiona; Coates, Sam; Savage, Michael (March 2002). "Financial alarm under the palms". London, UK: Times Literary Supplement. Archived from the original on 5 May 2013. Retrieved 11 July 2009. All de Botton's books, fiction and non-fiction, deal with how thought and specifically philosophy might help us deal better with the challenges of quotidian life, returning philosophy to its simple, sound origins. ^ "Why it is better to travel hopefully than to arrive". Evening Standard. May 2002. Retrieved 11 July 2009. ^ Conrad, Peter (9 April 2000). "When Nietzsche meets Delia Smith". London, UK: guardian.co.uk. Retrieved 23 March 2010. ^ "Flaccid fallacies". London, UK: guardian.co.uk. 25 March 2000. Archived from the original on 23 April 2009. Retrieved 20 March 2009. De Botton's new book consists of obvious, hopeless or contradictory advice culled from great thinkers on how to overcome certain problems of existence. ^ Jim Holt (10 December 2006). "Dream Houses". New York Times. Retrieved 6 April 2008. Like de Botton's previous books, this one contains its quota of piffle dressed up in pompous language. ^ Naomi Wolf (March 2009). "The Pleasures and Sorrows of Work by Alain de Botton". London: The Times. Retrieved 11 July 2009. ...this book examining "work" sounds often as if it has been written by someone who never had a job that was not voluntary, or at least pleasant. ^ Aitkenhead, Decca (3 April 2011). "How can you be a militant atheist? It's like sleeping furiously". London, UK: The Guardian. Archived from the original on 1 May 2011. Retrieved 3 April 2011. ^ Nagy, Kim. "The Art of Connection – A Conversation with Alain de Botton", Wild River Review, 19 November 2007. ^ "Alain de Botton: I would advise a friend to travel alone (metkere.com/en)". metkere.com. ^ "Alain de Botton's Living Architecture Project". Buildingdesign.com. ^ Searle, Adrian. "Art Is Therapy review – de Botton as doorstepping self-help evangelist". The Guardian. Retrieved 30 May 2014. ^ "Janet de Botton and family". The London Sunday Times. 27 April 2008. ^ "Philosopher king: Alain de Botton finds glamour and drama in the world of work," Katy Guest, The Independent, 27 March 2009. ^ "Office affairs", Lynn Barber, The Guardian, 22 March 2009. ^ "On De Botton". The Irish Times. 6 April 2009. ^ Janet de Botton profile, theglobeandmail.com; accessed 26 February 2014. ^ Barber, Lynn (22 March 2009). "Office affairs". The Guardian. London, UK. ^ Patalay, Ajesh (16 December 2006). "My Life". Telegraph. Retrieved 16 December 2015. ^ "A Point of View - BBC Radio 4". BBC. Retrieved 17 November 2017.